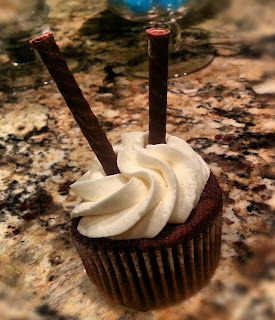 Christmas is 3 days away and I have the PERFECT cupcake for you! 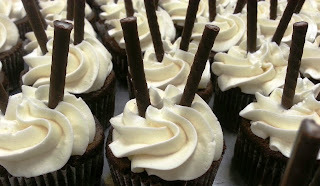 We served these babies this past week at a sports banquet for the students and they were a huge hit! If nothing else, you need to make the dark chocolate cake. It was chocolatey - but not too chocolatey, moist and delicious. Oh and the buttercream. Man oh man, I have never had swiss meringue buttercream, and it is officially one of my new favorite things - and I am not a huge buttercream fan! And I am always down for peppermint anything. Simply an AH-MA-ZING dessert I tell you. Mix milk and cocoa powder together in pan. Heat gently until well blended. Mixture should be warm but not hot. Turn off heat. Add vanilla and stir. 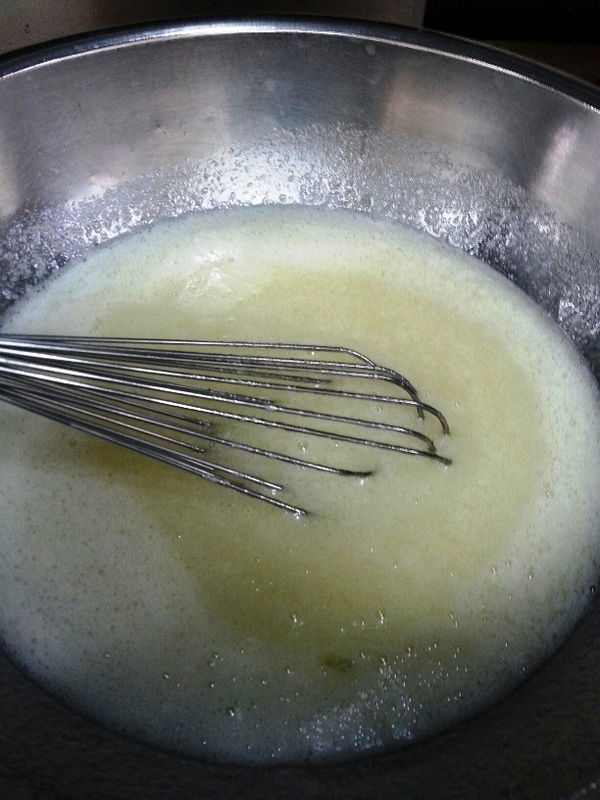 Whisk remaining dry ingredients together and set aside. Beat butter in bowl fitted with paddle at medium high speed about 35 seconds. Scrape down bowl. Gradually sprinkle in sugar; beat until white and fluffy 3-5 minutes. Add eggs one at a time beating a full minute after each addition. Scape down bowl. With mixer on lowest speed add 1/3 dry ingredients mix until almost incorporated. Add 1/3 chocolate mixture mix until almost incorporated. Repeat process until ingredients are added. Be sure to scrape down bowl. Beat until mixture looks satiny about 15 seconds. 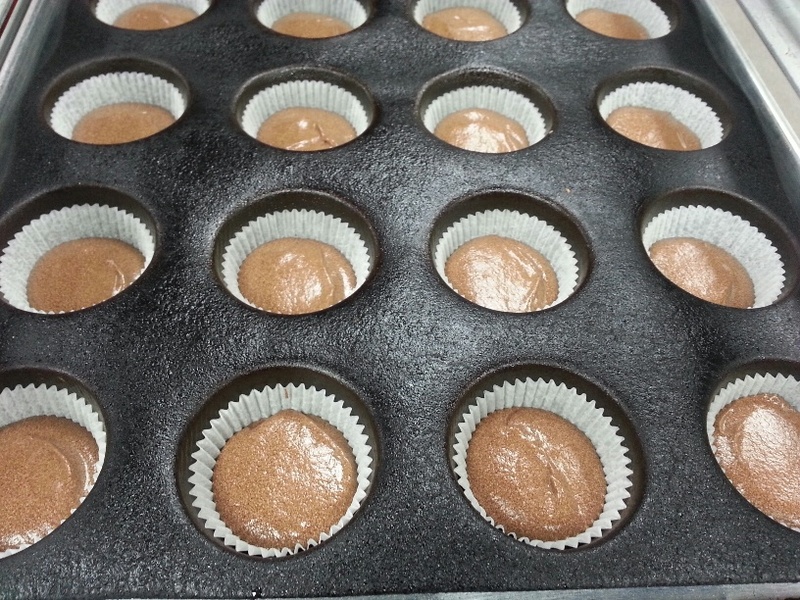 Line cupcake tin. Fill 3/4 full of batter. Bake for 20 minutes. Allow to cool before frosting. Fill a saucepan (large enough to fit your mixing bowl just a few inches) with two inches of water. Bring the water to a boil, then reduce heat to med-low so water continues to simmer. In your stand mixer bowl, hand whisk the egg whites and the sugar just until combined. 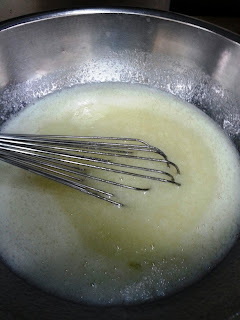 Place over simmering pot and whisk for approx 4 mins until the egg whites are hot (about 150 degrees). 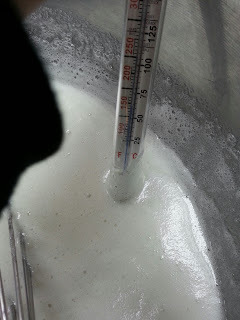 The sugar should be dissolved by this time as well. (I used a candy thermometer, because I am a terrible guesser). Place bowl on stand mixer and attach the whisk attachment. 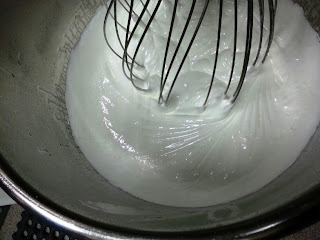 Whisk on medium speed until whites have increased in volume, are thick and glossy and the outside of the bowl is just slightly warm to the touch (this can take up to 10 minutes!). Remove whisk attachment and replace with paddle attachment. Beat on low-speed until mixture is completely cooled. Increase speed to medium and add butter pieces one at a time. Scrape the bowl and continue to beat until buttercream is glossy, smooth and thick. It may separate at first, but continue beating and it will emulsify. Add vanilla flavoring, a pinch of salt and peppermint and beat until combined. Add food coloring if desired. Use immediately. Garnish with a chocolate covered peppermint stick.